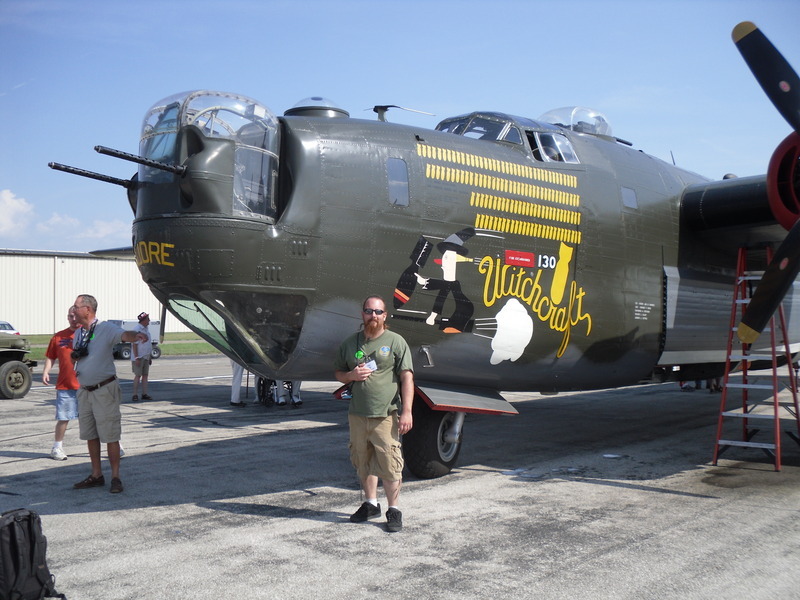 Warbird Information Exchange • View topic - B24J "the Jigs Up" Photos? B24J "the Jigs Up" Photos? Post subject: B24J "the Jigs Up" Photos? I'll start with saying I'm new to this forum but have found this seems to be the best place to ask for some help! My grandfather was a mechanic for the B24J Liberator "the Jigs Up" - serial #42-51232, stationed in England in WW2, and about half of the photos out there of the ship have my grandfather standing next to the nose art. So this particular B24 has a special meaning to me. Sadly, it, with 8 of it's 10 crew members, was lost at see after running out of fuel in December 1944. I have searched everywhere for photos of this aircraft and can only find the few of just the nose section, port side. I'm wondering if anybody has seen what the starboard side of this aircraft looked like. Id like to assume the starboard side side was left blank and just had the nose art on the port side, but I could be wrong. My ultimate goal is to recreate this in model form but will have to do a lot of scratch work for decals of the nose art. Also, I do own a copy of "Squadron of Deception" (fantastic book by the way) which has a painting of "the Jigs Up" on the front cover BUT again, port side only. Any help would be GREATLY appreciated! I've also attached a photo (not mine) I found online of my grandfather next to the nose art of "the jigs Up". Post subject: Re: B24J "the Jigs Up" Photos? Welcome aboard. My girlfriend's grandfather bailed out of a 9th A.F. B-24J named "The Scorpio." Years ago on WIX there was an argument about what Goering said when he saw P-51's and B-24's , etc. flying over Berlin. One person thought he said "Well the Gig's up." someone else thought it was "Well. the Jig's up." Anyway, I'm going with what's painted on your grandfather's plane! I can't help on the photo, but I'll recommend Josh from bedlamcreations.com if you need custom decals made. I've used him several times, he's quick and does a great job. Thanks for the comments guys. I’ll keep looking! And I’ll defintey check out bedlamcreations for some decals that will be great! Nathan, My father was the pilot of "The Jigs UP" and I believe that there are two living crew members. The best place to get more info on her would be to contact Stephen Hutton (his father was the tail gunner) and he is the one who authored "The Squadron of Deception". His best e-mail would be: smhutton@36rcm.com and the Squadron web page is: http://36rcm.com/ . Stephen has tones of paperwork and pictures. I have some but he would probably be your best help. Mr. McCrory, thank you for the response! I will reach out to Mr. Hutton and yourself through private email if that is ok!